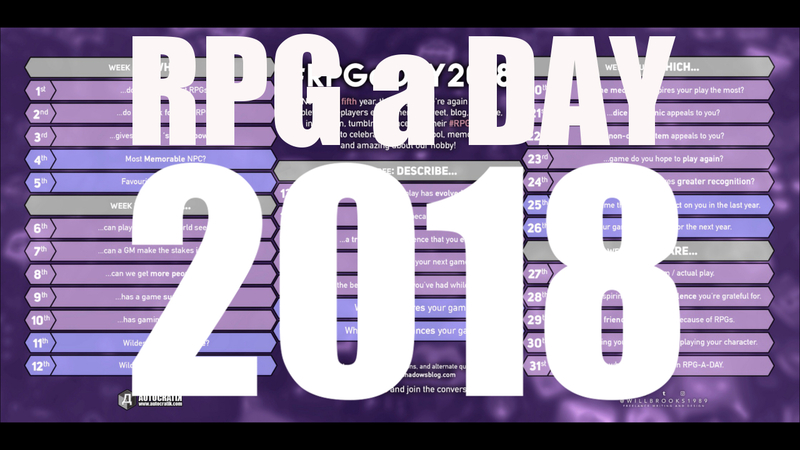 Day twenty-eight of #RPGaDAY2018 is another remixed question. Taking the original question from 11th August 2016 of "Which gamer most affected the way you play?" has been remixed to become "Share whose inspiring gaming excellence you're grateful for?" So many people I'm grateful for, but the term "gaming excellence" is a tricky element. I guess once again it'll have to be down to my current gaming group - Stoo, Edge and Debs. Gaming with them opened up a whole world to me - a world of gaming where the point was not to power game, or to simply "win", but to tell a cool story, develop some amazing characters, and experience gripping and sometimes hilarious scenes. I'm especially grateful for Debs' involvement in any game I write, as she hates learning rules - she's a great judge of when a game is unnecessarily complicated. On top of that, she's just about the only thing that keeps me writing sometimes. Special mentions should go to the awesome people in addition to this who have helped when I need to brainstorm ideas - Charles, Alix, Cam, Derek, Jason, Jarval and Ellie. A tricky question today, but I'll be interested to hear what you have to say. Until tomorrow, stay multi-classy!